Simon Morris workshops are purpose built for carrying out paintwork and repairs on all manner of HGV and LGV commercial vehicles, situated on the Tendring peninsular between Colchester and Clacton-On-Sea and in close proximity to Harwich and Felixstowe docks. 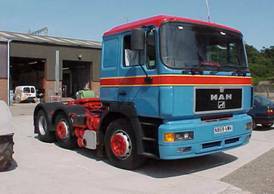 We carry out new fleet paintwork for the main truck dealers in the area including; MAN ERF UK Ltd, Volvo Trucks Ltd, Scania GB Ltd and other heavy and light commercial vehicle companies in our area. The premises comprise of a 6 0ft low bake oven which can accommodate either a 40ft trailer, a double decker bus or two tractor units being painted simultaneously as the booth can be divided into equal bays or a three quarter and a quarter bay for panels and sundries. We are also able to blast down to bare metal, removing rust and old paint as required. We also "etch blast" new vehicle chassis to key new paint coatings. Other blasting can include; garden furniture, gates and any metal items. Website Designed By Shane Lord. All Rights Reserved.